This amazing passage of music makes for fun discussion, perceptive listening, and exploration of hemiola, syncopation, perception issues, and more. I typically teach it in first-semester music theory classes, but also adapt it for non-majors music as well. The music in this “exhibit” is all taken from the second movement (Minuet & Trio) of Mozart’s String Quintet No. 4 in G Minor, K. 516. This exhibit begins with a simple task: what is the meter of this example, and what would an appropriate time signature and rhythmic notation be? Try conducting along with the recording. If you thought that was simple, you should have no trouble doing the same with this passage. OK, so it’s a little more complicated. This excerpt seems to have a pickup. The rhythm is a little more lyrical, plus it’s got a wide contour that breaks up the phrase into a couple of fragments. But still no problems. What’s a good basic unit for these notes? Let’s try quarters. I happen to know that Mozart used quarters. Here’s where I pull the rug out from under you. I’m going to play you a passage of music… I don’t won’t to reveal too much beforehand, so I’m just going to ask you to figure out what’s going on here. Let’s listen again to try to figure out what’s wrong. It will help now that we are thinking of the notes in steady quarters. SO – what has Mozart done to confuse us? It’s hemiola, ladies and gentlemen, but not just any boring kind of hemiola you read about in your textbook. We know that hemiola is a sort of two-sounds-in-the-time-of-three (or vice-versa), and that’s what this is. But the hemiola of this example is rhythmically offset so that each hemiola figure begins by giving a REALLY strong accent on the weakest part of a bar. (What’s an accent on a weak part of the bar called?… anyone… YES! It’s just a syncopation). 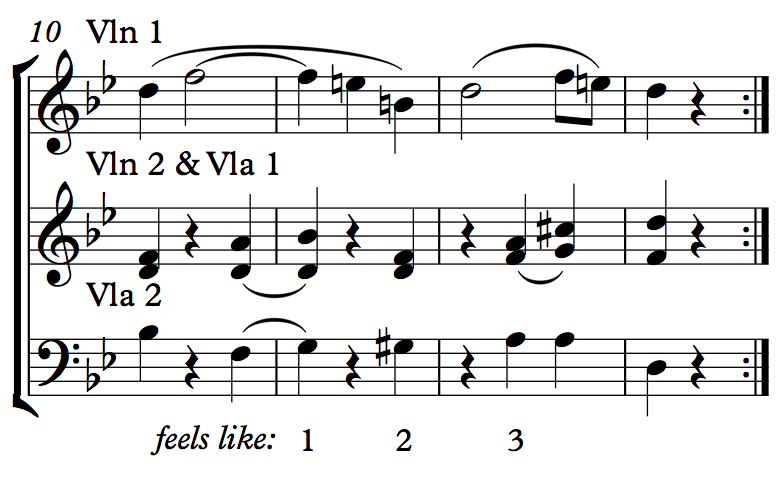 We should take time-out to look at the nice syncopation at the end, too. That wasn’t part of what we examined before, but it makes a great hiccup at the end of the phrase. An extra little challenge would be to take the last four bars of the phrase above and notate the clever string parts below it. They have their own weaker hemiola, as well. No? Really? OK. That leaves some time in class for one more rhythmic dictation, from the trio of the same movement of the same quintet. What’s the take-home for students? Mozart was very very clever, which is news to students who only have heard Eine Kleine Nachtmusik. Hemiola isn’t just a boring term that you can confuse with polyrhythm. It’s doesn’t have to be as simple as “two in the time of three” or something like that. Hemiola and syncopation are both techniques of metric obfuscation, and that strange mojo comes from combining them. Some music is like a “puzzle” that can be figured out by close-listening. I think that’s a major point of theory class. Not all music stands up to scrutiny like this, but the music that does pays off big-time.